That's ALOT of fish! Oregonian Don White had a knack for big cabrilla and other rockies this week including this hefty pair shown here with our Captain Alfredo. 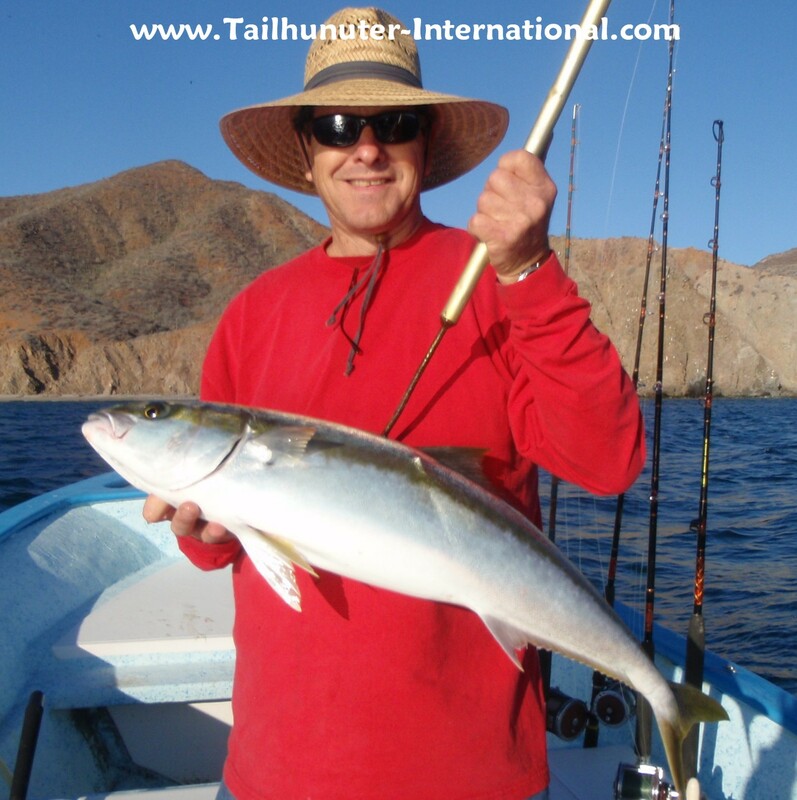 Don was fishing north of La Paz around Espirito Santo Island. Bob Solee, come down several times a year to see us here in La Paz and seems to always get a personal best or something unusual. 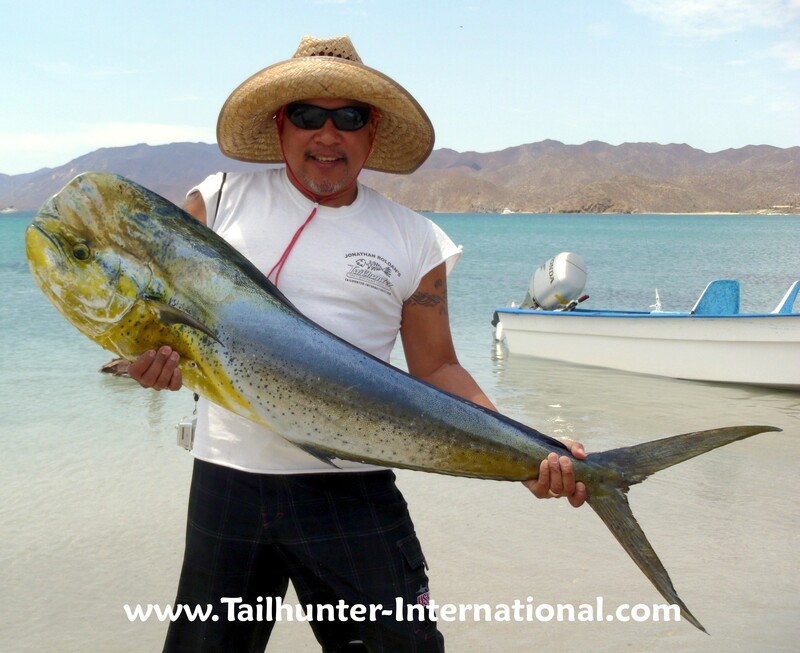 Yellowtail were on his "bucket list" and as luck would have it, he took one of the few yellowtail of the week fishing with our Tailhunter Las Arenas fleet. Bob is from the Portland Oregon area and is a custom fishing rod maker specializing in 3-pc. travel rods. 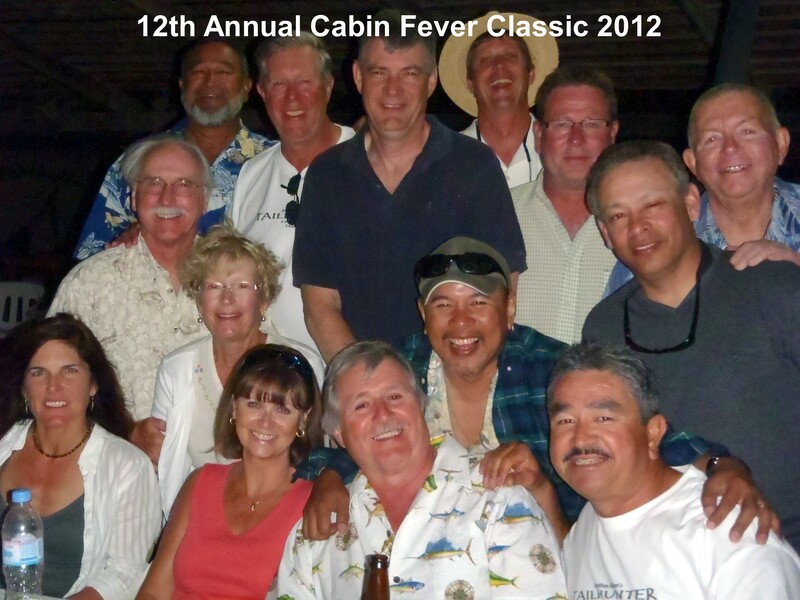 Yes, I do get out now and then and we had our 11th Annual Cabin Fever Classic here in La Paz and it was a blast. This dorado turns out to be the first of the season and quite a big boy for so early in the year! But it was swimming through a school of bonito when we spotted it and threw a live bait and it! A great catch. I'm standing on the beach at Bahia de Los Muertos. Easy to see why this is called a dog-tooth snapper. We call 'em pargo. John "JD" Drucker from Arizona is one of our La Paz regulars and comes several times a year. He had other fish that they never moved out've the rocks! First timer from Oregon, Sheila Maloney, had a big smile for this cubera snapper and a bunch of others she picked up working the east side of Espiritu Santo Island using a combination of sardines and live mackerel. It was another good week for roosterfish as the fish seem to be coming on stronger. Dave Swanson and Captain Joel pose with a nice pez gallo before setting it free. We would have more rooster photos, but most fish fortunately are let go so we don't get many photos! Dave got this near Espirito Santo Island. Matt Gesler has to be one of the funniest and happiest guys we can remember. Always laughing. For a first-timer he slammed fish for 3 days including these nice cabrilla. Rod Brown really wanted to catch a yellowtail and finally got one on the last day of the last hour of fishing. Rod hails from Alaska and makes 2 trips a year to visit us. She's the pargo queen! 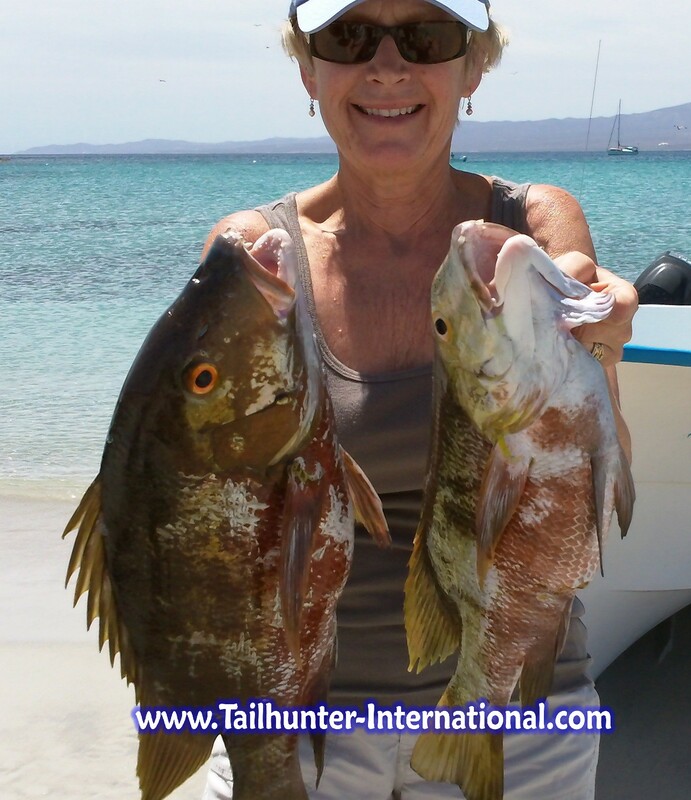 Carol Darby put 7 of these barred pargo in the panga compared to just one for her husband who said "She was on fire!" These are tough fish and this is quite an accomplishment. She stands here on the beach at Muertos Bay. 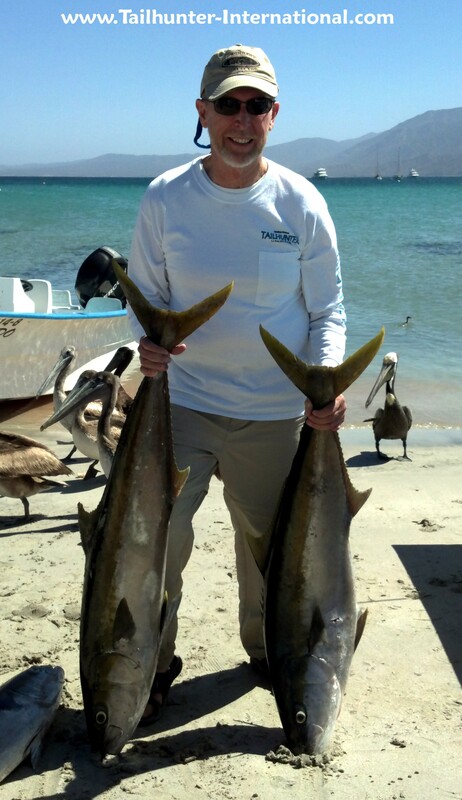 An interesting week of fishing down here in La Paz. I think our yellowtail bite is officially over although we’re getting a few punky firecracker yellows that aren’t any bigger than 5-10 pounds. And…every now and then, especially north of La Paz, a nice little jag of the bigger fish jumps up and goes on a chew. But, for all intents and purposes, things are changing and it’s best not to lament what’s NOT biting and concentrate on what IS biting! Basically, it’s turning into your typical spring smorgasborg of fish species. Frankly, it’s a lot of fun because from day-to-day, you’re never sure what’s going to hit. Sometimes it changes within the hour. I believe this past week alone we got over a dozen keepable species of fish! This included our first dorado of the season, a nice 25 pound class mahi picked up on live bait right in the middle of swarming bonito schools. 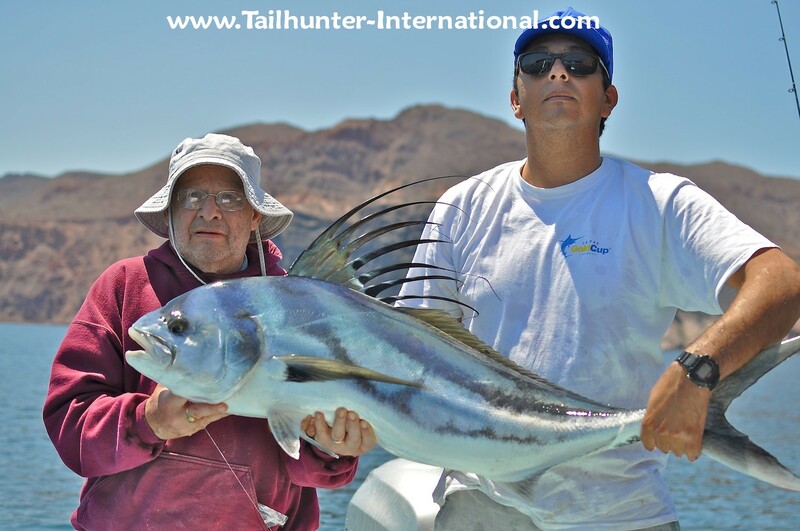 This also included some really nice action on roosterfish that are hitting in numerous spots around the La Paz fishing area. As well, cabrilla, grouper, sierra, amberjack, jack crevalle and all three members of the pargo family (barred pargo / pargo liso/ dog tooth-snapper) were all taken this week usualy in the areas around underwater structure. I gotta tell you…take a look at some of the photos from this week. Don’t blow off fishing for cabrilla or pargo. Some of these fish are HUGE! Try stopping some of these bad boys before they get to the rocks. I was on the water a number of times this past week and I would guess that about 2 nice pargo or cabrilla were caught for ever 10 hook ups. Imagine a fish that can swallow a whole mackerel or a whole small needlefish that we’re using for bait. That is a BIG fish with a BIG mouth! One day, I personally lost at least 8 and only putting 3 aboard…and then again ONLY after amping up my gear from 40 pound test to 60…then to 80 pound test and basically my trolling sticks! It sounds silly, but if you can’t turn their big heads of these guys, you might as well just throw bait in the water and watch them blow up on the surface and tear it up and forget fishing. You’re just feeding the fish! But, it’s incredibly exciting when you’re slow trolling a bait through blue clear waters and you can see the bottom just a few feet below. You start chumming baits and out of nowhere, 20, 30 and 40 pound fish start going ballistic behind the boat…and then your line screams! The biggest factor this week was the darned wind! I tell you…one day we had barely wind and had a great day. Next day, the winds ripped us apart and we could not even get bait. The best we could do all day was troll Rapalas all day for less-than-happy results. When we went after yellowtail north of La Paz, it took us two hours in heavy winds and seas trying to catch a dozen mackerel for bait. After getting enough bait, we hit the yellowtail spot and it was like fishing in a washing machine. The current was so strong we couldn’t even get the mackerel down deep enough to the fish because the pangas were getting blown off the spots. Hopefully, usually the winds keep diminishing but it’s not over until it’s over. I’m really excited about seeing so much sargasso weed floating around out there! Given that we got that first nice dorado, if we get a little more water temperature, schools of dorado can’t be far behind. Some commercial guys are seeing them as well as marlin sitting on the surface just sunning and not quite ready to go on the chew. Give it just a tad more temperature and the big boys should come flying! Verda Boyd with her favorite, Captain Jorge, has a knack for putting fish in the panga. The retired sheriff's officer from the S.F. 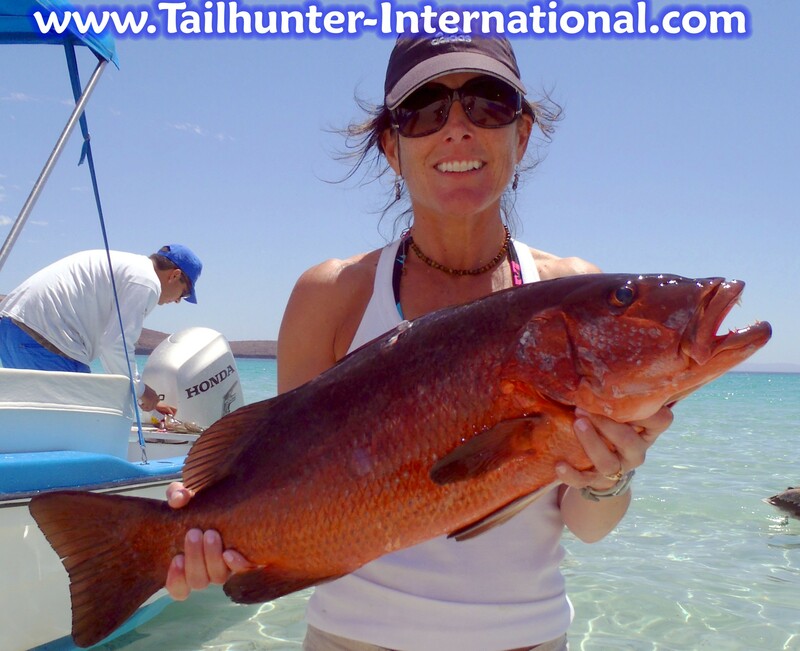 bay area holds up one of her pargo she hooked off Punta Perico near Las Arenas. Pargo became a main focus over the last week or so as yellowtail tapered off. Take a look at what might be one of the last yellowtail of the season. Our amigo, Jack Perris, from Garden Grove CA fished with us a few days and put a variety of fish in the boat including this yellowtail. 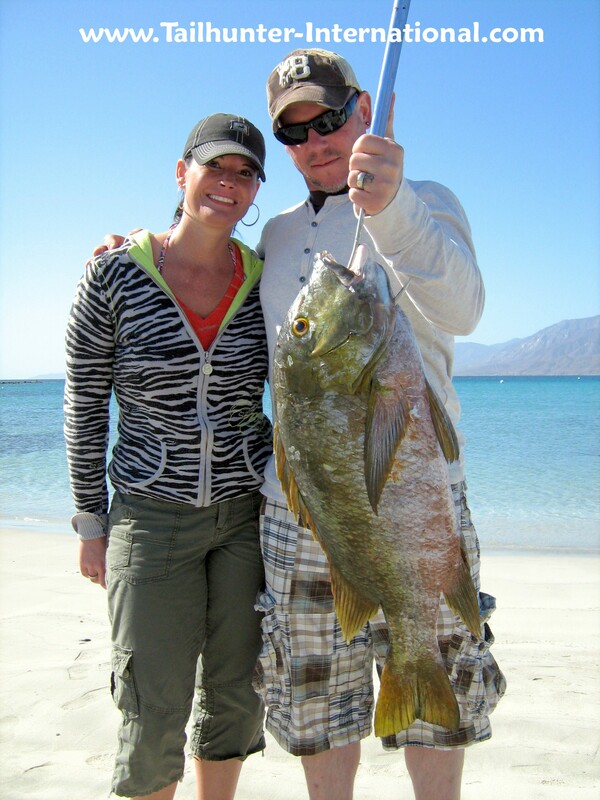 Craig Norton from Oregon poses with his wife, Debby, and a fat pargo mulato (barred pargo). 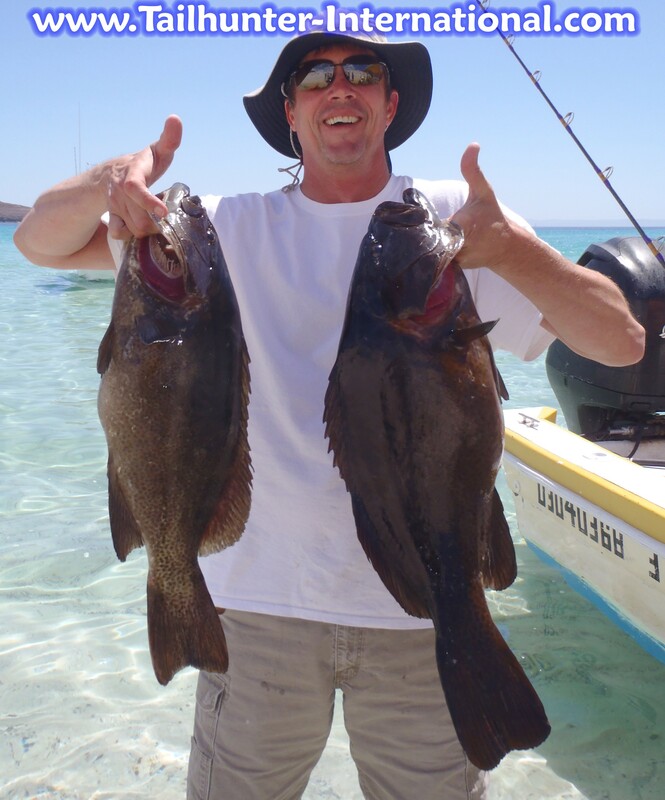 Craig was on his first trip with us and was fishing with our Las Arenas fleet. 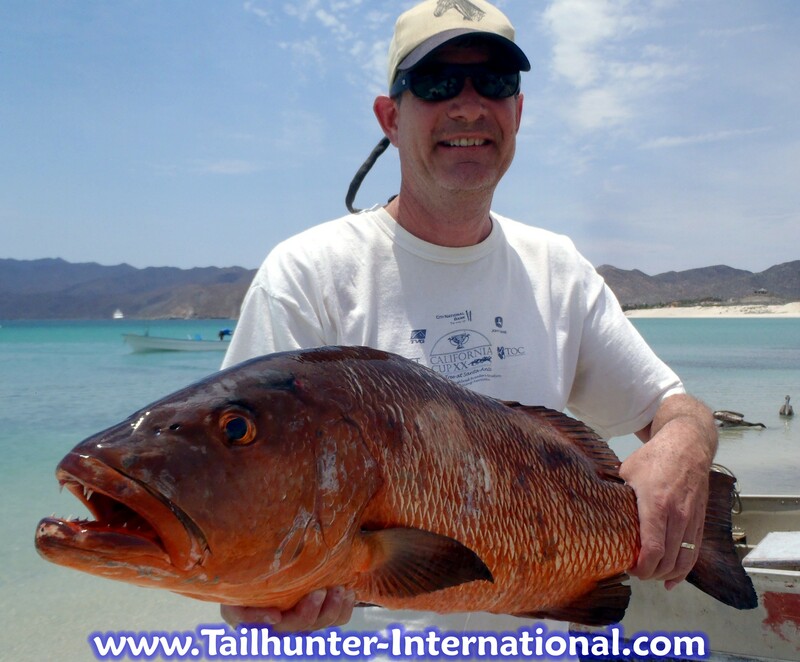 The big fish hit just outside of Bahia de Los Muertos. For a first time visitor, Desiree Weisser, from Orange Co. CA had a banner day on the water showing off a nice catch of sierra and bonito. Some of that went for ceviche that night at the Tailhunter Restaurant. She's posing on the sand at Bahia de Los Muertos. We were wondering when the roosters would begin to show up and I think it was really that we were just concentrating so much on the yellowtail. Each week it's gotten a little better, but this past week, the roosters were schooling up. NOthing huge, but most fish were fun 5-20 pounders! It would appear that the incredible yellowtail bite of 2012 has left us. With the exception of a few fish here and there, not many yellowtail to speak of the last two weeks and even the commercial pangeros are off to fish other species. In it’s place, the focus has been on other species that are normally caught at this time, but haven’t gotten much attention at al the last 3 months. And so it goes! We have clients down these days who look forward to nothing else but the challenges of these pargo year-after-year. 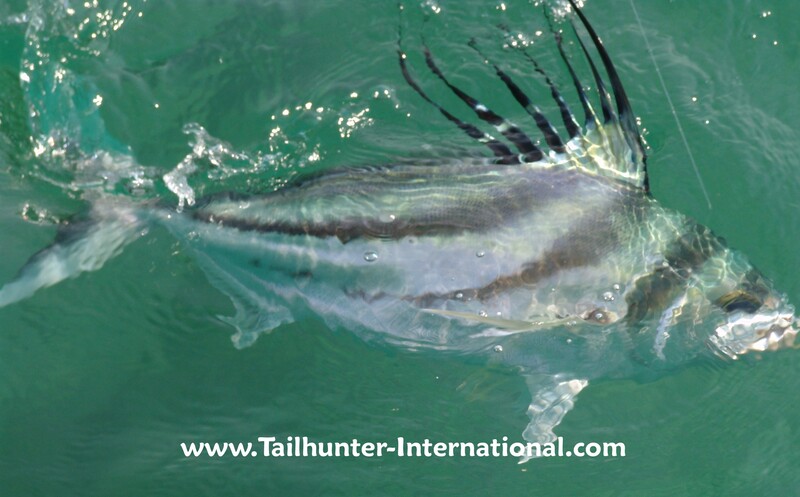 In addition to the pargo, we’re getting our first real action on the roosterfish as well. 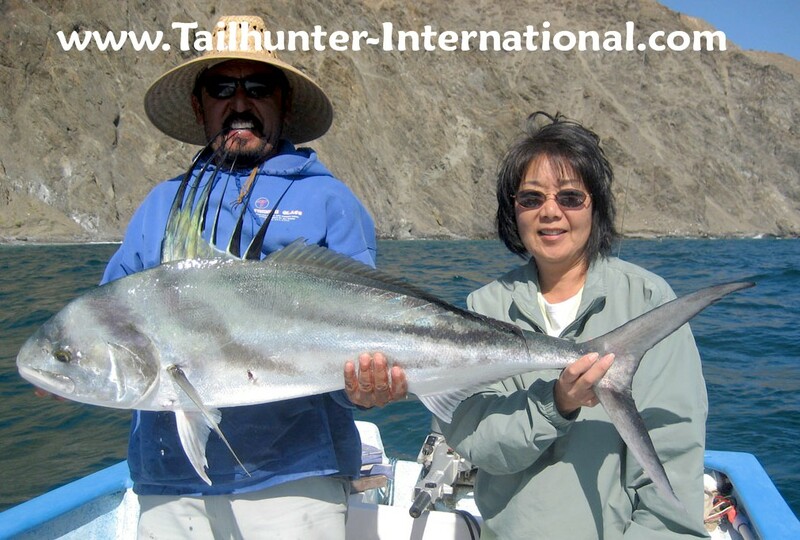 Again, it might be a function of the fact that with the yellowtail moving on, the roosterfish are getting more attention. However, reports of 2, 3, 5, 10 roosterfish caught and released have not been uncommon this week with our largest being about 40 pounds as the school-sized fish appear to have moved in to feed. In addition to the pargo and roosters, some of the other classes of fish that helped keep the action rolling include snapper, sierra, cabrilla (seabass), bonito, ladyfish and some fat jack crevalle. 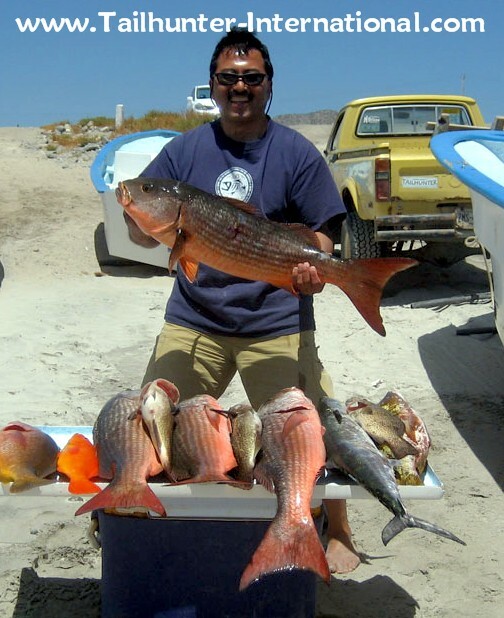 One of the more exciting things that happened this week was a report from one of our amigos who lives in La Ventana and fishes all the time. When he’s not fishing, he’s kite boarding…his new love. 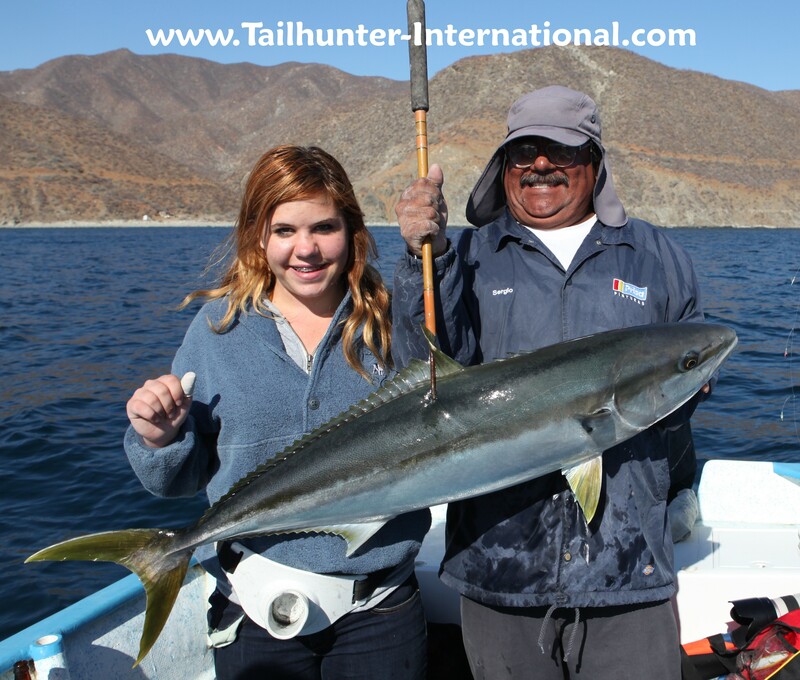 Young Caroline Coomber from San Diego hadn’t done much fishing before, but got her biggest fish ever fishing with Captain Victor although she’s reluctant to touch the big yellowtail on the gaff. She was fishing off Cerralvo Island. 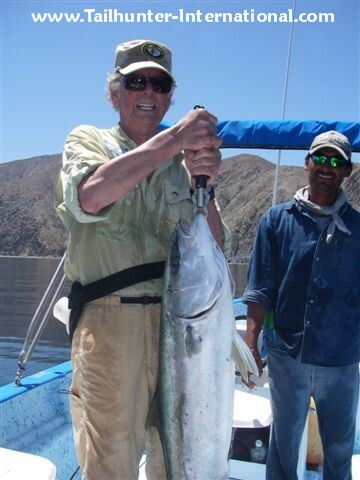 Skip Coomber usually comes to La Paz several times a year, but had not visited in a few years, but made the most of it heading out to fish Cerralvo Island and using mackerel took 2 nice yellowtail like this one. Skip is from the San Diego area. It was not our best week of fishing here for the most part. Given the great bite we’ve had for the last 3 months, this past week was disappointing mainly because we’ve been spoiled. So many big yellowail! So given the bar has been so high and the expectations so great, this past week was actually a “normal” early spring week of fishing, but compared to the previous weeks/months, it was a bummer. For one, we had some hangover weather from Easter week. During that time, full moon and high winds, especially to the south pushed a lot of water around. This pulled up colder greener off-color water from down deep. In the long-run, this is good. The cooler water with all the nutrients are a naturally occurring thing and brings up a lot of nutrients that makes the fishies grow, but short term, it really shuts off the bite. Sort of like throwing the fish into a cold shower of off-color water. It sometimes takes awhile for them to shake it off and come around again. And I think that’s what happened. Plus, the winds continued to blow. In fact, several days were darn-right bumpy out there and on one day we had to just bring everyone back to town. It’s the first day we’ve had to cancel boats in about 2 years. The sun was out and the weather was nice, but the chop and wind were just crazy. So, the clients were cool about it and it was just better to bring everyone in. It would have been nearly impossible to get bait anyway. And that was another problem. With the winds battering some of our bait holes around the islands, it scattered the bait. Like looking for a needle in a haystack and the pangas would have a hard time just getting into the spots close to the rocks without some bit of risk. So….well, like I said, it was more like a “normal” early spring bite. We did get some yellowtail but not as many as we had been getting. We also got some really nice cabrilla (Mexican seabass) and pargo (lost quite a few to the rocks) and some of the biggest sierra I have ever seen! Oh, and also lots of bonito. We had a number of families out so the bonito provided great action for many of the kids most of whom had never fished before. 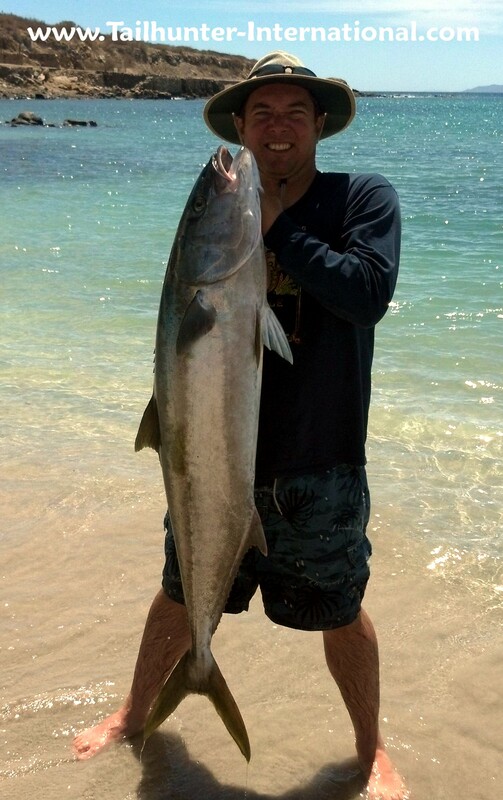 We also did get a few roosterfish as well in the 20-pound class which looks like they’re finally showing up! 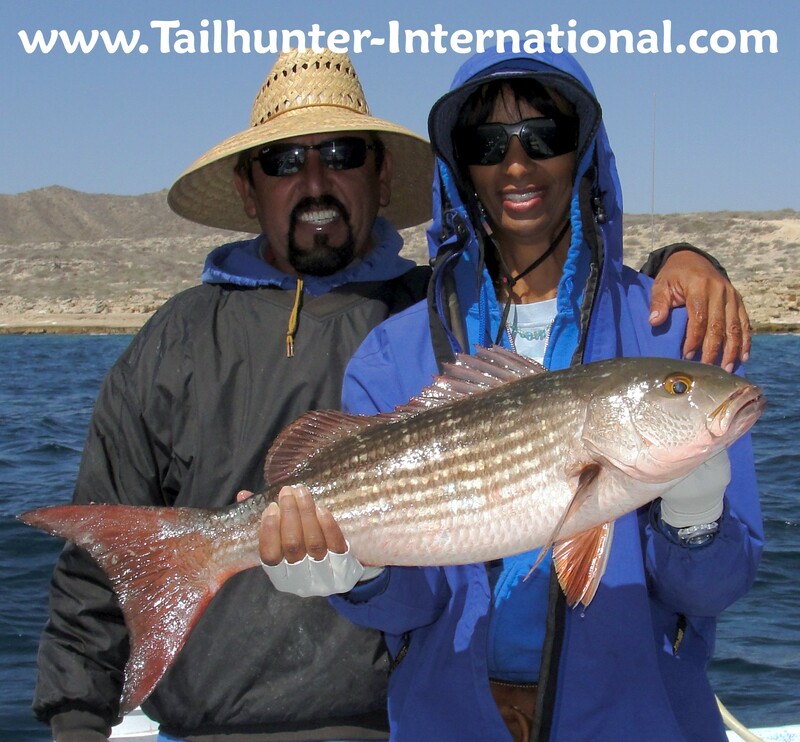 We did have some flyfishers who were fishing Baja for the first time and they had a blast. In fact, as one of them told me “It’s not like steelhead or trout fishing. I’m sore! These fish beat you up!” he said with a grin. That day he got several jack crevalle, several bonito, a few sierra, needlefish and roosters. Great variety! As I’m writing this, waters seem to be getting better daily so, as long as the winds keep diminishing, the waters will clear up. Even in Baja every now and then, there’s an off-week! Nice way to start a trip! Slamming 7 huge yellowtail at the north end of Cerralvo Island on mackeral and lures. 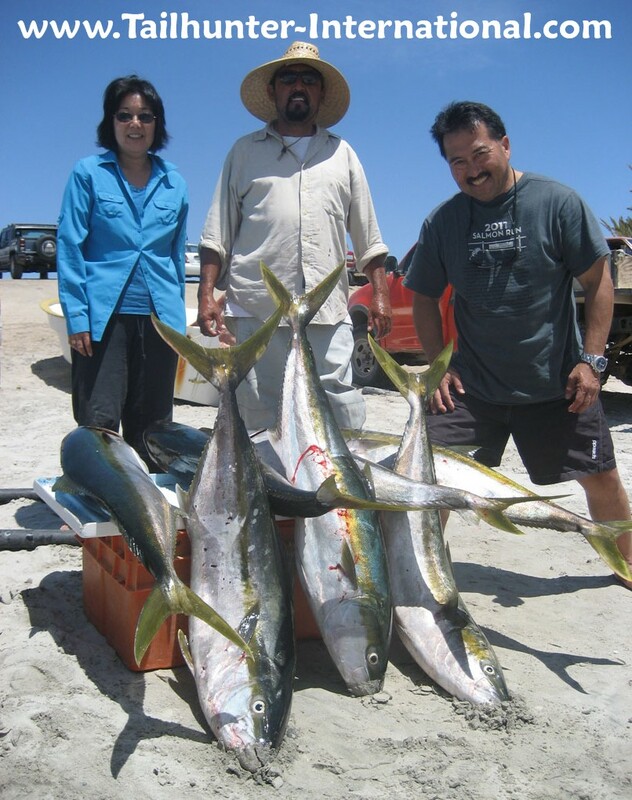 Jeff Sakuda and Marianne Sugawara said the fish were "all over" and they "fished until their arms fell off!" Jeff said, they easily could have put 10 in the boat. Our first "official" rooster of the season and Marianne's first rooster as well even tho' she fishes several times a year in La Paz. The fish hit a trolled rapala near north Cerralvo while they were fishing for yellowtail. Captain Jorge smiles on! 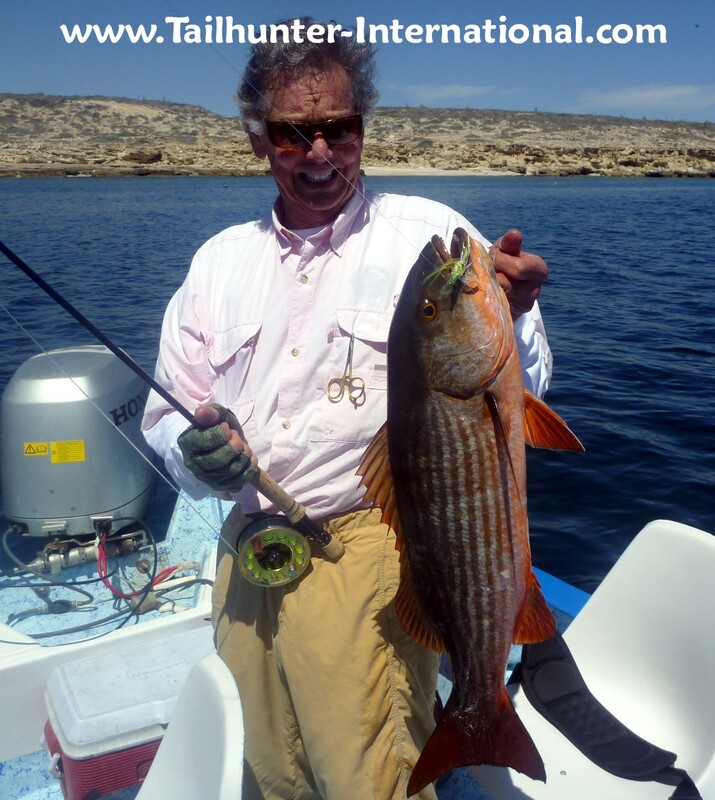 Not only did he hook a world-record fish, but Bill Mitchell also fly rodded one of the most difficult fish in our waters even for anglers fishing with heavy conventional gear He took this nice pargo liso (mullet snapper) off Punta Perico which you can see in the background. 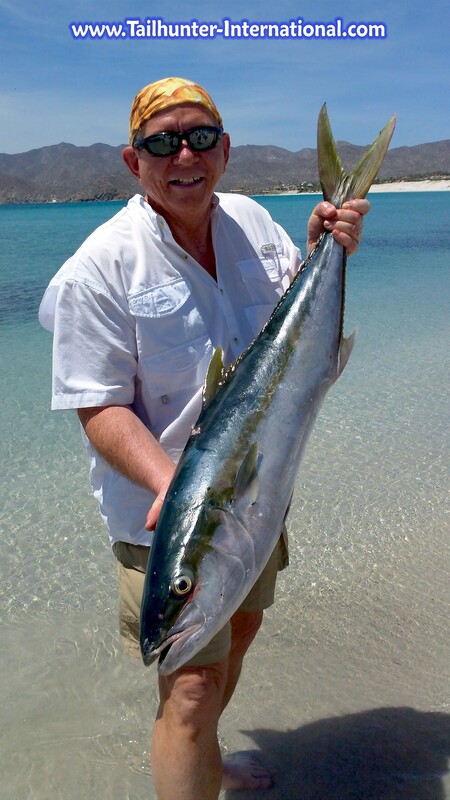 In all my years here in La Paz, I've only seen less than a handful of these fish on the flyrod. Everyone has been asking where are the pargo? Well, the yellowtail bite has been so good the last 3 months that few want to tangle with the doggedly difficult pargo! But the fish are definitely here! Jeff had a pretty decent day on the big-toothed fish! Also, on the rack...sierra, cabrilla and snapper! Pot luck great eating! MORE PARGO THIS WEEK AS YELLOWTAIL MOVE TO OTHER AREAS AND…ALMOST A WORLD RECORD! We here at Tailhunter wanted to wish all our amigos and tribal members a safe and happy Easter. Hope you had/ have a good one. We had a crazy good week here. It seemed like everyone was on vacation. Sunshine and weather were perfect and it seems most folks took the whole week off as the beaches were packed and town was really in a festive mood all week. Hope wherever you were you got a chance to enjoy things with your family! On to the fishing report!!! A pretty decent week of fishing although it seems the big fish scattered a bit. Winds seemed to increase during the week and that probably had a lot to do with the bait moving and hence the fish. 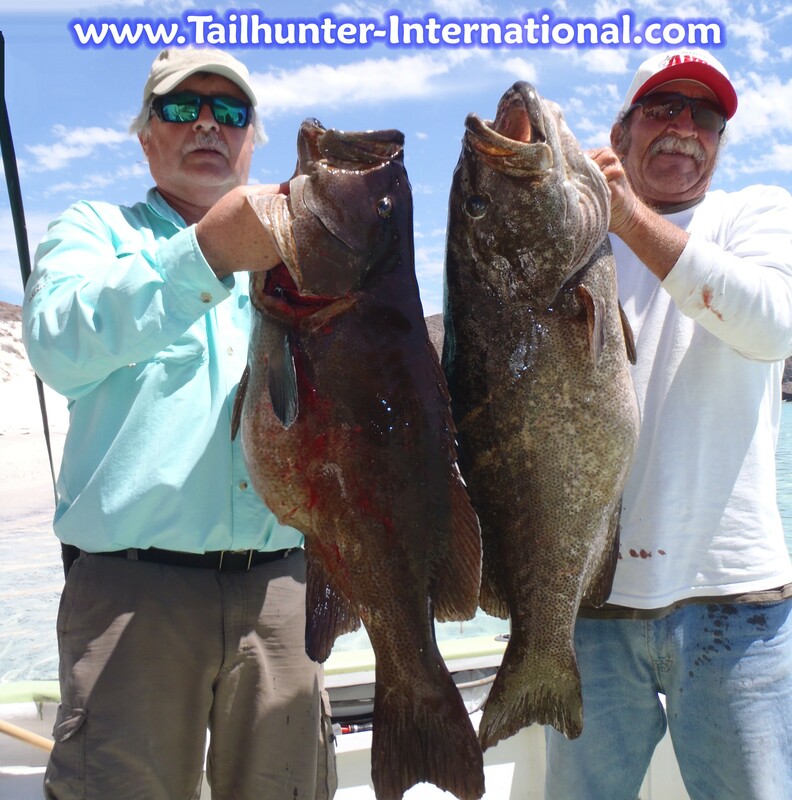 Most of our better fishing was done at the north end of Cerralvo Island although our regular spots around Ventana, South Island, Bahia de Los Muertos, Punta Perico and Boca de Alamo all had their moments. Probably our most exciting moment came with Bill Mitchell of Carmel CA pretty much un-officially blowing the IGFA yellowtail record out of the water on the flyrod! We are pretty pumped up. 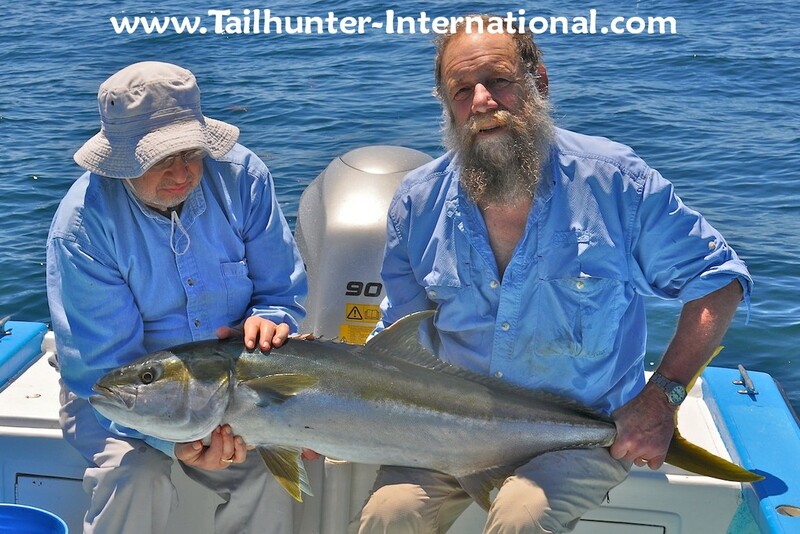 The current record had been in 2006 with a 31 pound yellowtail caught on 20 pound tippet in Loreto. Bill hooked his on the flyrod and it turned into a 90 minute fight and resulted in a huge 40 pound ‘tail besting the IGFA record by 9 pounds! He fought the fish to the boat where his 9 wt flyrod snapped. Unfortunately, when we approached the IGFA, Bill’s potential record would be disqualified because the rod snapped! Oh well. Still a great fish and Bill was thrilled. We know they are out there! He also nailed a nice pargo on the flyrod as well. A pretty nice trip! As for the rest, as I said, the best spot was at north island of Cerralvo. That’s where the best spot was for the big yellowtail. Mackerel worked best, but dropping down blue/white iron on the yo-yo produced some whoppers! As the week moved along, the winds came up and the yellowtail bite tapered. However, it did give our anglers to finally chase some other species and as I suspected, the pargo, cabrilla and sierra were right there! “Huge schools of swarming big pargo!” as one of our anglers explained to me! They were also on the feed so we got some nice hookups. However, so many fish were lost to the rocks. More than half the hookups ripped the lines! But that’s pargo fishing! We also got our first official roosterfish of the season as well. The are another species that has been around for a month or two. But no one has been fishing for them as they chased the yellowtail. We have been doing our weekly fishing report now for about 16 years updating it weekly. It’s become quite popular appearing in magazines, newspapers, internet message sites, websites and numerous other places and we figure about 10,000 weekly readers. But, for some of you, that’s not enough! and also “like” TAILHUNTER INTERNATIONAL (the restaurant/bar) and you’ll get even more of what’s happening with us down here in La Paz! Fishing tailed off just a tad this past week, but yellowtail were still up to bat with some nice fish like the two-fisted catch by Carl Lange from Bakersfield. Both fish fell to live mackerel. Muertos Bay is in the background. 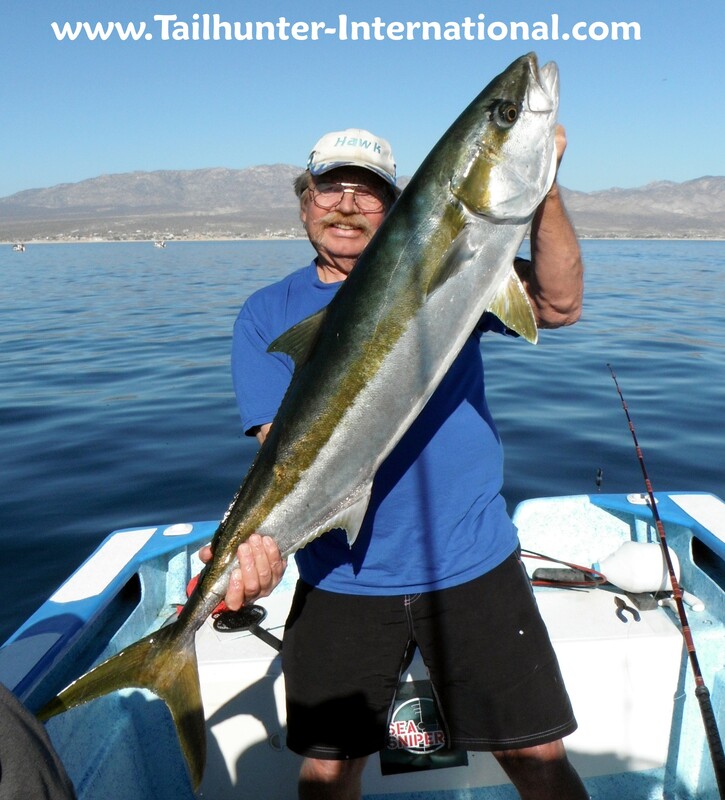 Our local "ace" from La Ventana James "Hawk" Davis has been sticking fish every week since this yellowtail bite started back in January. Note the flat waters behind him and the towns of La Ventana and El Sargento. Hawk holds up a thick yellowtail. Standing on the beach at Muertos, Travis Simmons fished with us for several days and holds up his biggest yellowtail of the trip. 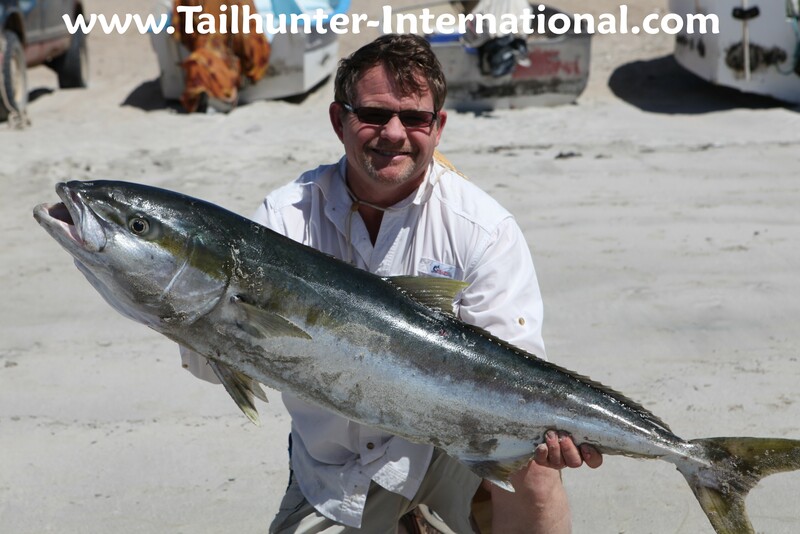 He was fishing with Captain Jorge and dropped a big mackeral in this guys' mouth! I know this cabrilla caught just off the rocks at Punta Perico (in the background) ended up as dinner ,because the fisherman, Art Flippin, took it to our Tailhunter Restaurant specifically and had us cook it up for him! Great time for Mexican cabrilla...seabass! TOUGHER WEEK ON THE FISH AND FISHERMEN AS YELLOWTAIL CONTINUE TO POP UP! It was hard to put a finger on the fishing this week. As usual we had a little wind some days which didn’t help, but on the days the winds laid down, the fish were certainly there! Some nice yellowtail too! Friends on the beach and commercial pangeros I spoke to during the week said sometimes the yellowtail were so thick it was like “the old days!” Fish were foaming and crashing the surface and scattering bait in such big log jams of fish that it could be seen from shore…which sometimes isn’t too far off. Imagine 25-45 pound fish blowing up en masse! Our problem was that we didn’t have a whole lot of anglers out there although everyone did catch a few of the big boys. Also, we had some rookies and God bless ‘em they had fun! But sometimes these fish can be pretty mean and we were losing more fish than we were putting in the boat. Still…they had fun but if you think back, most of us were there at one point where you’re new and you’re not sure which end of the reel is up and which way the handle turns. Then, the biggest meanest fish of your life suddenly yanks a 50 pound rod in half and your adrenaline goes zero-to-sixty in nano-seconds and it’s chaos as everyone is talking to you and yelling at you! And then before you know what’s up…ZING POWIE! No more fish! You thought you were ready but the biggest fish you ever caught before was a rainbow trout or steelhead. You weren’t ready yet for one of our Baja big boys! And so…maybe you lose a few as you get into the learning curve and get your chops down. The problem is…for many folks this time of year…they are one-day anglers. They’re in town and decide to do a day of fishing. They’re our snow birds who are just getting out of the cold back home. They go out and catch a few fish….or lose a few fish…and just when they’re getting the hang of it…the day is over! And they were only fishing that one day! They go home with some nice bags of cabrilla or sierra and some chunks of yellowtail, but if they had fished just one more day, it would have made a huge difference and they’d be better prepared. 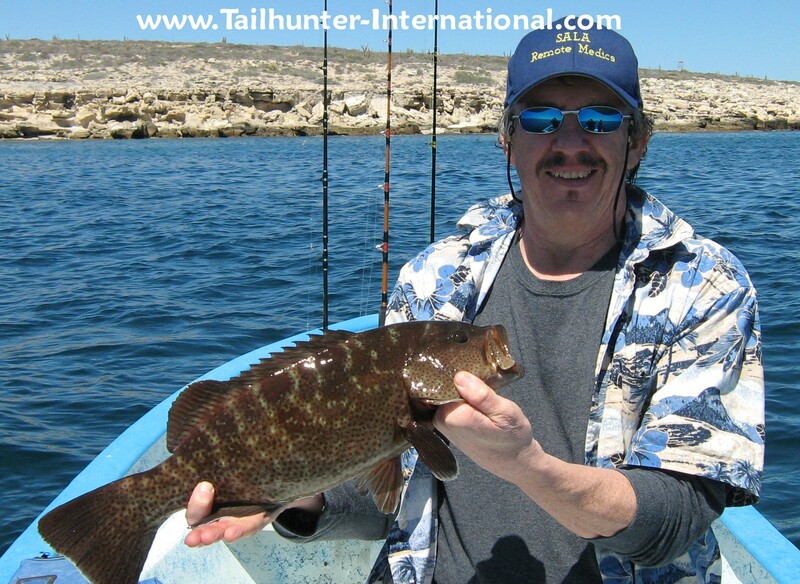 The fish were up around Ventana Bay, South and North Cerralvo Island and our usual stomping ground at Boca de Alamo just south of Bahia de Los Muertos. Often pretty close to shore and in shallow water. 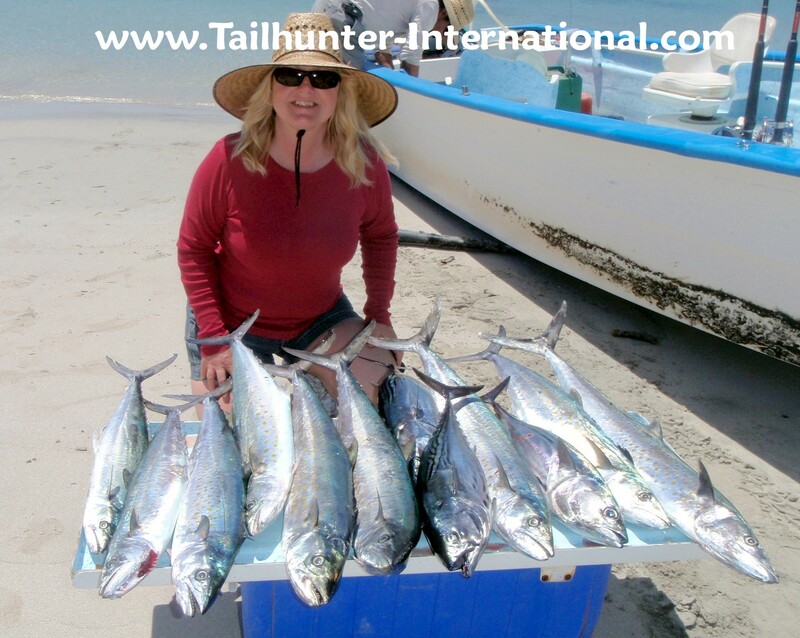 Getting mackerel can sometimes be a chore as those are the preferred “candy bait” for these big sluggers. It’s hard to really get a read on the other species we usually catch this time of year, but we did show some smaller pargo, cabrilla, sierra and jack crevalle as well as a decent bite on bonito!